Pink diamonds, those diamonds with a natural pink colour, are a rare and unique stone, perfect for unique diamond engagement rings. The source of their colouring is still being debated, though is commonly considered by geologists that it is a result of the enormous additional pressure these diamonds are put under during their formation, that alters their molecular structure, and as a result, their hue. They are of the subcategory named fancy colour diamonds, containing all those diamonds that are naturally coloured. The Argyle Mine in Kimberley, Western Australia is one of the worlds most abundant sources of these phenomenal diamonds. 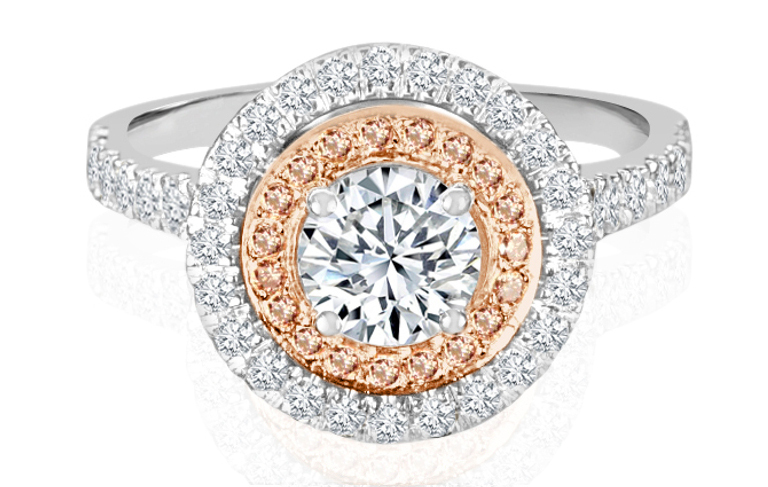 Pink diamonds create a unique engagement ring. Natural fancy coloured diamonds come in different cuts, and pink diamonds pair well with a rose gold shank. Our Melbourne store showcases an extensive range of beautiful diamond engagement rings, though if you want something truly unique and personal, our expert diamond design jewellers can forge something new and unique based on your designs. At the top of their field for jewellery making and design, our team will spend time getting to know you and work closely with you to come up with one-of-a-kind, handcrafted, custom-made diamond rings. Ring shopping can be an overwhelming experience, though our experts will guide you through the process and find the right diamond engagement ring for you. If you don’t see what you’re looking for in-store, our team can craft something new based on your designs. When looking for diamonds, the crucial factors to be aware of are: colour, cut, clarity and carat. What is considered a ‘perfect’ diamond is entirely colourless, and these are generally the most expensive. Though most diamonds might appear neutral, they do have slight tones of brown or yellow. The colour range is labelled from D – entirely colourless to Z – heavily tinted. The colour grade is so subtle that it often is not visible, but diamonds past the grade of N may be visible, and beyond S the hue may grow intense. Naturally coloured diamonds come in all colours, with yellow being the most common, the rarest are red blue, green and white. Carat is merely the size, measured in weight. The most apparent factor and generally determines the price. A carat equals 200 milligrams and is then divided into 100 points. Diamonds from 0.50 – 0.75 carats are the most popular due to their size and value. Larger diamonds are much harder to find in mines, so due to their rarity, they can be much more expensive. After all that there is still the metal and setting to think of. The team at GN Designer Jewellers can guide you through the process of selecting the right ring, or pair you with a designer to custom make something truly unique. With so many options available it is simple to make custom diamond rings that allow you to design something incredibly sentimental; after all, it will be worn for a lifetime. At GN Designer Jewellers, we design and make your custom diamond rings. Our team specialises in engagement rings, wedding rings and a wide variety of other luxury jewellery. We have a wide range of diamonds and coloured stones sourced from around the world. Designing custom-made diamond rings with GN Designer Jewellers allows you the opportunity to explore the colour, proportion, setting and style of your engagement ring. When working with highly-experienced diamond design jewellers, you will see your ideas evolve into a unique creation, and you will have an engagement ring that perfectly expresses your vision, and is worthy of whom you have chosen to wear it. For more information about our custom-made diamond rings, created by diamond design jewellers in Melbourne, contact GN Designer Jewellers today.